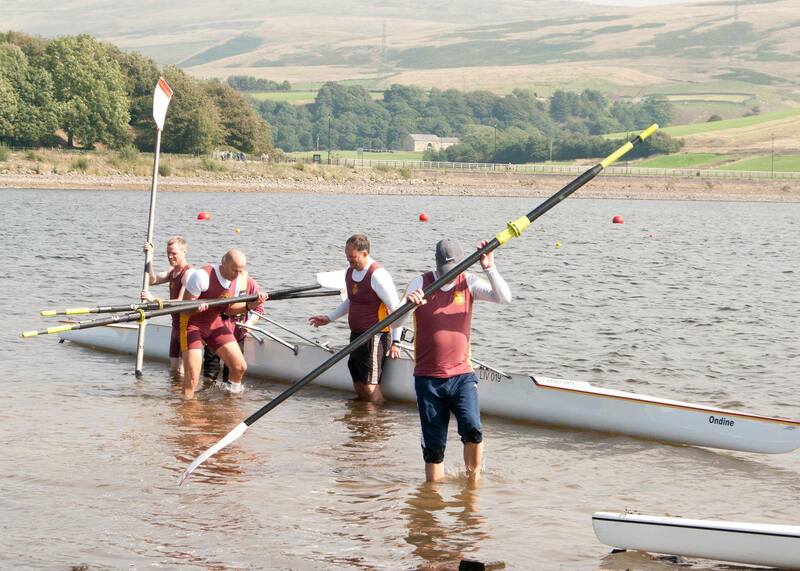 As usual, Vics entered a lot of crews at the last regatta of the year at Hollingworth Lake. In the past, we have won the Victor Ludorum, both for the Juniors and the Seniors. This year however, there was stiff competition for our 25 entries. In spite of the competition we had 16 finalists and had 7 wins. Unfortunately, no Victor Ludorum this year! The wins were: Mixed Mas C 2x, where Mike Vick and Kate Wilson beat Tees by 2 seconds; W1x Band 2, Kate Wilson beat Lancaster John O’Gaunt by 15 seconds in her semi final and John O’Gaunt (a different sculler) by 3 seconds and Bradford by 8 seconds in her final; Mike Vick again in Mas F/G 1x, where Mike won his straight final by 15 seconds over Lakeland and 21 seconds over Bradford. Both of Mike’s opposition were Mas F and therefore 5 years younger. Mike and Kate’s wins prove the value of long-distance hard training, as they are competing at the Lincoln-Boston Marathon over 49.2 km (30.6 miles) and have been putting in the miles on the dock. In double sculls, Jayne Pumford and Michelle Fisher continued their season’s wins with WMas B 2x, where they beat Tees by 5 seconds in their final. Unfortunately, Jayne and Michelle were not so fortunate in their W2x Band1, where they lost to Runcorn in their semi-final. 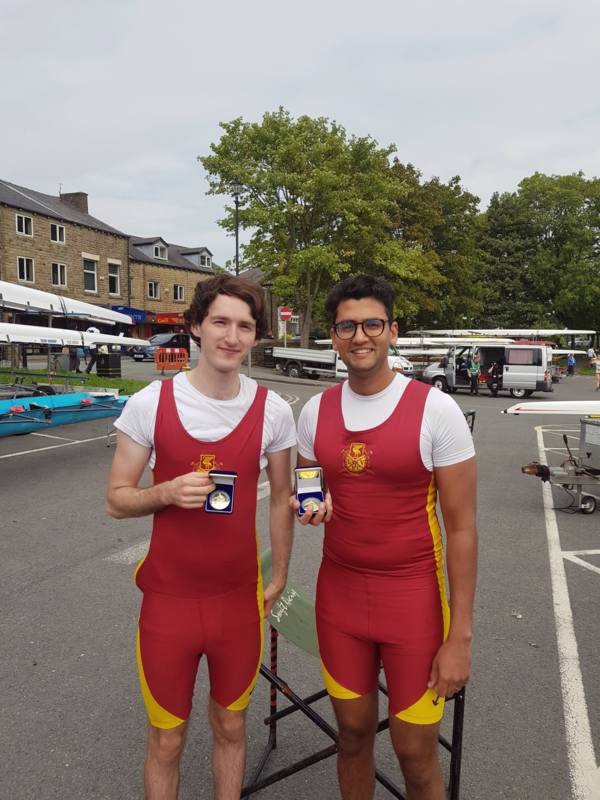 In Open 2x Band3, Arvind Mahendran and Sam Crowe beat Windermere by 5 seconds and Hollingworth Lake by 10 seconds to win their final. John Davies showed the form that he has developed over the years by winning Mas B 1x, beating Coyne from Mersey by 5 seconds in a straight final. The Mens Mas B/C 4+ of Mike Egan, Matt Myers, Chris Rycroft and Andy Jones beat Northwich to win their final. Of the other finalists, the Mixed Mas B 4x- (Pumford) lost to Doncaster by 2 seconds in their final; Mixed 2x Band2 (McWilliams) lost to Mersey by 4 seconds in the final but beat Windermere into third place; J17 2x (McEvoy) lost to Hollingworth Lake by 4 seconds in the final, with a second Vics double (Walters) in third place; J14 1x (Smith) lost to Tees by 13 seconds in the final; WJ15 1x Band1 (McFarlane) lost to Trafford by 4 second in the final, with a second Trafford sculler in third place; WJ16 2x (Jones) beat Hollingworth Lake in the semi final but finished third in the final to two Trafford crews. For the first time in many years, the club had three eights in finals at Hollingworth Lake. A mixed eight (Smith) lost to Hollingworth Lake by 1 second but beat Mersey into third place by 16 seconds. The Mas C 8+ (Jones) unfortunately came up against a very strong Hollingworth Lake crew with the Price brothers on board (long standing Elite oarsmen) and lost by 30 seconds. A great performance however, from the Open 8+, where a Vics Junior crew lost by 8 seconds to a powerful Lancaster John O’Gaunt crew and beat Trafford into third place by 4 seconds. Those losing in earlier rounds and semi finals included Sam Fairbanks in Open 1x Band3, who lost by 1.5 seconds to a Lakeland sculler; WJ16 4x- (Semple) who lost to Trafford/Hollingworth Lake by 2 seconds in their semi final but beat Lancaster Schools into third place by 8 seconds; W2x Band3 (Kelly) came third in their semi final; J18 2x (Osbourne) also came third in their semi final, whilst the J17 1x of Smith and Walters finished second and third in their semi final to a sculler from Tees. Hollingworth Lake ran Explore coxed quad races for beginners within the Sprint Regatta and Vics new members raced in ‘A’ and ‘B’ crews. The ‘B’ crew beat Lancaster John O’Gaunt but lost to Windermere and the ‘A’ crew lost both their races to Warrington and Lancaster Schools. All in all, a good day for Vics, with participation across the club and the promise of a productive winter season for all. The close finishes to so many races shows that Vics crews are in the frame and just need that extra little push to win more events. No Replies to "North of England Sprint Regatta – Hollingworth Lake"